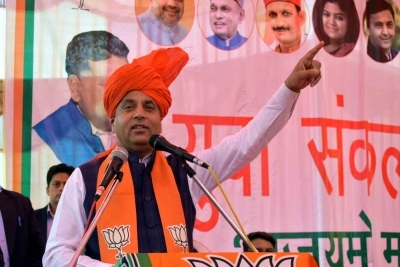 Shimla, April 16 (IANS) Himachal Pradesh Chief Minister Jai Ram Thakur on Tuesday said the Congress has neither a vision nor a national development policy, whereas the BJP has a strong leadership of Prime Minister Narendra Modi, who guided the country to be one among the top five nations. "It is only because of Narendra Modi that India has managed to become the fifth world economic power and in the next years, it is set to become the world's second-biggest economic power," Thakur said in a statement. The Bharatiya Janata Party (BJP) leader said just to compete with Modi in these elections, various political parties have entered an "unholy alliance" where every party has a "self-centric" agenda. "These political parties neither have a common ideology nor a political coordination. Their sole aim is just to stop Modi from coming to power." Thakur said the plans of these political parties would never be a successful "as the voters have made up their mind to elect Modi again". Thakur said the Congress in the state is frustrated and the BJP would comfortably retain all the four Lok Sabha seats. Himachal Pradesh will go the polls on May 19.